Orders placed before 4:00 PM CST with prescriptions in place and payment made are shipped the same day. Ground shipping for US transactions over $99 is free and express options are quoted during checkout. We also ship internationally, for details see International FAQs. How do you ship and what does it cost? Note: Our checkout page will quote the following information for you. Simply type your shipping address in, scroll down to the shipping section, pick your method and look at the price in the box to the right. Using this tool, you can shop multiple methods and obtain a final price. We ship primarily via FedEx and US Mail. We offer free ground shipping to all 50 US States and US territories for orders over $99. We reserve the right to decide which carrier will ship orders qualifying for free shipping. Shipping costs for times which reflect receiving a package at a certain time (AM or PM) are quoted based on ZIP code. Please Note: Express carriers typically define end of the day as 5 PM for business addresses and 7 PM for residential addresses. However, it has been observed that residential deliveries can take place as late as 9 PM during busy seasons, high volume periods, and weather events. These times are defined and controlled by the carrier, not CPAP.com. If your order includes a machine, the extra weight will add $10.00 to your shipping charges. FedEx Next Day Air Early AM is offered to qualifying zip codes and will be quoted accordingly. Dependent on location, Next Day Air service (delivery by end of business) may be available for Hawaii, Alaska and Puerto Rico. The cost of Next Day Air service is custom quoted based on the weight of the parcel and the exact address. The actual cost can only be determined by creating a complete order. Alaska locations may offer Next Day Air Early AM (delivery by Noon) and is custom quoted. Puerto Rico and Hawaii locations do not offer Next Day Air Early AM (delivery by Noon ). FedEx 3 Day Select is not available to Puerto Rico, Alaska or Hawaii. Add $10 for Next Day Air, Next Day Air Early AM and 2 Day Air when a machine is included in the order. If you choose Next Day shipping for an order placed and shipped on Friday, it will be delivered on Monday unless you specify Saturday delivery in the Comments section of your order. If you wish an order placed on Friday to be delivered on Saturday, the charge increases by $10.00. For example, if you order a mask on Friday for Saturday delivery, the cost will be $35.00. If your order includes a machine for Saturday delivery, the cost will be $45.00. When you order from us, you can expect your order to ship the same day when the order is placed before 4 PM CST Monday through Friday, provided prescription requirements are met and the equipment is in stock. We publish stock status on each product page. You can expect your package to arrive within 3-5 business days for most locations within the United States. A tracking number link will be provided with each order via email. 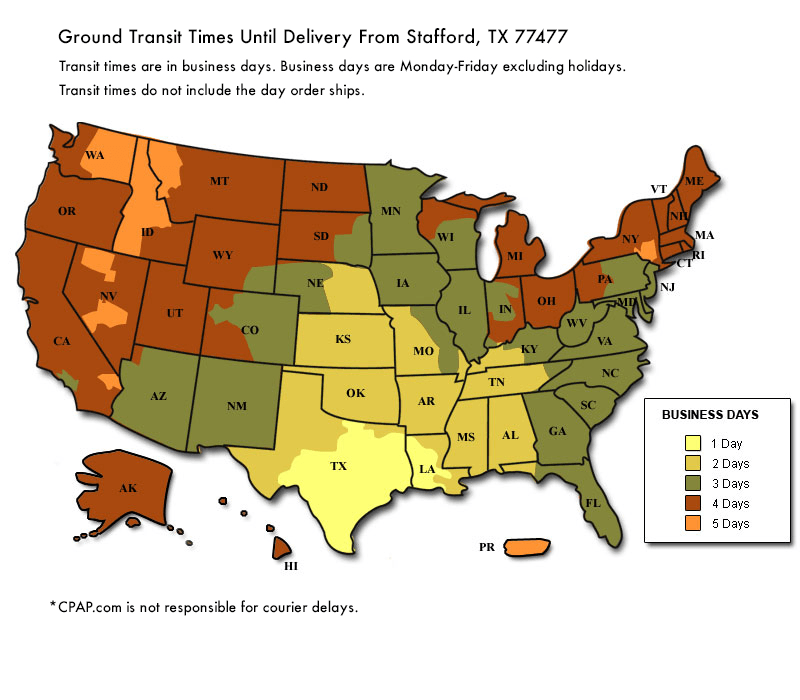 Ground shipping times to the US vary depending on the distance from our warehouse in Houston, Texas, but the longest distances usually take only five business days. Please note, ground shipping time is not guaranteed. CPAP.com is not responsible for courier delays. Will you ship to an APO address? Yes. Shipping is $7 for any purchase under $99 and free for any orders totaling $99 or more. Will you ship to a Post Office Box? Yes. Orders to PO Boxes are shipped via US Mail, include standard tracking services, and qualify for our standard same day shipping policies. Federal law requires we have a valid prescription on file before shipping a mask, machine, humidifier, Provent, oxygen concentrators and some heated tubing. How can I tell if my prescription is valid? Written for "lifetime need", "99 months", have a future expiration date, or no expiration date. Who can write the prescription? Select "Contact my doctor for me." You can also have your Doctor fill out our standard prescription form or Provent Prescription form and send it to us. If you believe you may have a prescription associated to a previous order with us, please call us toll free at 800-356-5221 or international at 713-351-3414. Can I use an International Prescription? If the prescription is not written in English the entire prescription must be translated into English on the original document. If you have a valid international prescription, upon receipt and review of the prescription, we will ship your order to any U.S. state except Texas, or to your country of residence. We are unable to request a prescription on your behalf from a doctor outside of the United States. For more detailed information on prescription requirements, please see our Prescription FAQs. How can I provide payment information? Call us to provide credit card information or log into your account and add a credit card. We accept Visa, MasterCard, American Express, Discover, and JCB credit cards. Call us to provide authorization and will will send a request to your email. Please go to www.paypal.com and log into your account using your PayPal email address. Once there, click on the "Send Money" tab and enter cpap@cpap.com as the email address you are sending the payment to. Enter the amount due on your order - you can find this total in the confirmation email we sent when the order was placed. Check the goods box and click Submit. If using this method, please reference your order number in the message field. Failure to reference your order number may result in a processing delay. PayPal will send an automated email to us once the payment has cleared. We accept PayPal eChecks. Orders paid via PayPal eChecks will remain on hold until cleared by PayPal. We accept personal checks but will hold the order for 10 full calendar days from the date we receive the check to make sure it clears our bank account. Orders paid via money order will be shipped upon receipt. We accept foreign money orders. Payment must be made in U.S. dollars and issued by a bank in the country to which the order is shipping. We will verify payment with the bank and wait for payment to clear before shipping your order. To pay for an order via bank wire transfer, on the checkout page select 'Other' as the payment option. In the Customer Instructions text box, let us know you would like to pay with a bank wire transfer. Within 24-48 hours, we will email you with the instructions you will need to send us the wire transfer. Payment via a bank wire transfer process may take several weeks and depends on the financial institution. This may cause delays in the shipment of the order. Credit card or PayPal are faster options of payment and should be considered if the order is needed quickly. Please be aware, your bank may charge you to send us money. Please contact your bank to find out their charges as you are responsible for them. Please let us know when the funds have been sent. Once we receive the funds, we will ship your order. ResMed and Philips Respironics restrict the shipment of their products outside of the United States. In order to continue as a representative of their products, we must adhere to this requirement. We can ship ResMed and Philips Respironics equipment to any address within the United States. Please choose from the following options and email or call us to confirm how you wish to proceed. Provide a valid address within the contiguous U.S. We can update your shipping address and make the necessary arrangements. Exchange ResMed and/or Philip Respironics products for another brand. Check out a selection of comparable products we can offer you. You can also contact us for help in selecting comparable products. Remove all ResMed and Philip Respironics products from your order and ship out the remainder of your order. If you have a valid international prescription, upon receipt and review of the prescription, we will ship your order to any U.S. state (excluding Texas), or to your country of residence. Please contact us via phone to correct your address. You may also email us to confirm your shipping address, but we cannot guarantee that your order will ship out the day the email is sent if you choose to email rather than call. If your order includes a machine, the extra weight will add $10.00 to flat rate standard shipping charges. FedEx Next Day Air Early AM and Saturday Delivery is offered to qualifying zip codes and will be quoted accordingly. International shipping costs will be quoted upon the placement of an order with a complete and valid address. The actual cost can only be determined by placing a complete order. In compliance with policy as set by some manufacturers, we may only sell CPAP equipment to patients. Due to this policy, and the associated penalties for violating it, we are unable to ship ResMed and/or Respironics products to any Durable Medical Equipment Provider. We deeply regret this inconvenience. We are ready and able to offer you equipment from any other CPAP manufacturer. What other issues could hold up my order? Backordered item(s) on an order. We will notify you via email if there is an item on your order that is out of stock. Please let us know if you would like the rest of your order shipped, and the backordered item(s) shipped when it is available. If we do not hear from you, we will ship the order in it's entirety once all items are available to ship. The name on the prescription is different than the name on the order. Call or email us to authorize us to change the name on the order to match that on the prescription. There are comments or questions on the order that need to be addressed before we can ship the order out. You have more than one active order with us. Cancel one order and send the other out. Combine orders and ship them both, together. How do you ship to Canada? We offer shipping to Canada via a private carrier who transfers the packages to Canadian Post at the border. Depending on the delivery address in Canada, transit time is 2-3 weeks. All Canadian orders are tracked through Canadian Post, insured and tax exempt. If you have a UPS or FedEx account, we can ship via those carriers and have the charges applied to your account. Also, if you have a broker set up in the United States who can handle the transit from that point, we can ship via UPS to an address in the United States. What if I ship my order to a forwarding company? Packages shipped to a forwarding company may be opened and inspected. CPAP.com is not responsible for missing or damaged items when shipping to a forwarding company. Can CPAP.com Text or Call Me When My Order is Delivered? Unfortunately, CPAP.com is not able to text or call any customer regarding status updates, or upon delivery, for any order placed at CPAP.com. On the carrier's end however, there are a few ways you can get updated. If the order was shipped from USPS, customers can choose to be notified of delivery by text or email. If the order was shipped with FedEx, customers can be notified by email only. Signing up is fairly easy, and can be done by following prompts on each carrier's package tracking website. A paid order placed before 4PM CST M-F will be shipped that same day. We even carry the appropriate fuses for your machine! If you aren't currently using a humidifier and are waking up with dry airways or congestion, adding a humidifier to your set up may alleviate this problem. Shipping is free for all orders over $99.00 within the US!